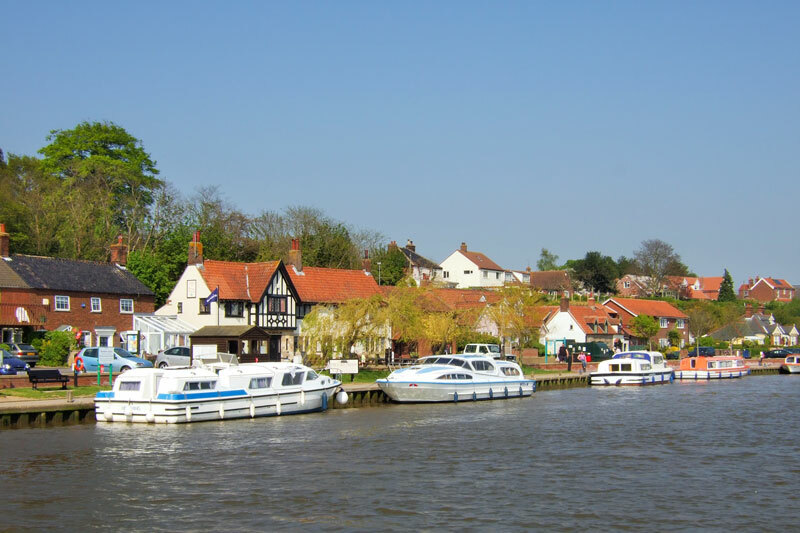 The village of Reedham is set on high ground overlooking the River Yare. At one time before the draining of the marshes this could have been a coastal village. It is possible that Breydon Water once stretched as far as Hardley Cross. Attractive cottages of various ages line the riverside road. Also along the road are two pubs, a boatyard and the post office stores. Up in the village is a grocery store a fish & chip shop and a working men’s club. The grocery store is open everyday until late. Local attractions include Pettitts Animal Adventure Park and the Humpty Dumpty Brewery. Both are a short walk from the quay. The quickest way is via the footpath next to the railway bridge on Holly Farm Road. 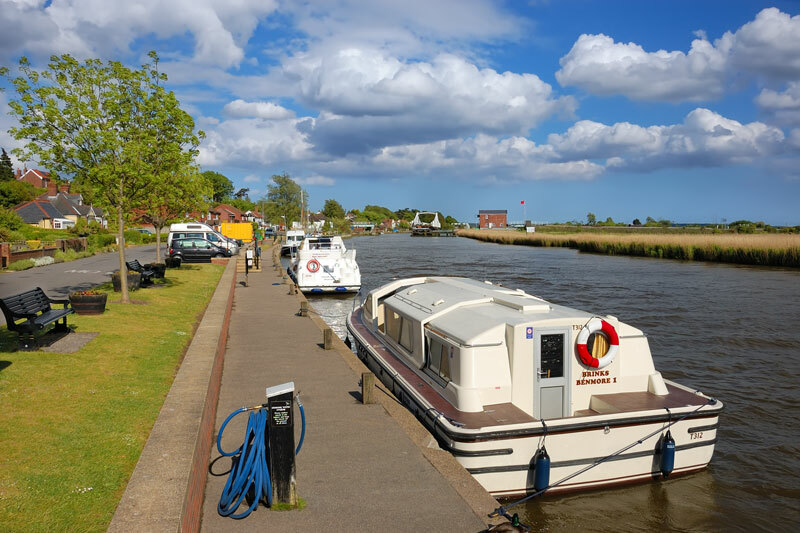 The quay is approx 217 metres long but Reedham is a popular spot and the space soon fills. If all boats moor considerately there is room for about 19 boats. This does not including mooring double alongside. The tide flows very fast, always come in to moor against the tide. On an ebb tide do not turn after the downstream end of the public moorings. To avoid getting carried into the bridge, go through the bridge and turn around on the other side. A quay attendant is on duty here between 9 am and 6 pm and will help you moor and give advice on tides etc. Although the quay is next to the riverside road it is none the less an attractive spot. Behind the flood defense wall is a tree lined lawned area with benches and flower tubs. There is also a section of parking for visitors and residents cars. Dotted along the quay are a number of water points. The electric boat charging point is next to the quay attendants office. In the middle of the quay is a Community Information Board and disposal point for boat refuse. This includes a small bottle bank. Fuel, water and pump-out facilities are available from Sanderson Marine Craft. 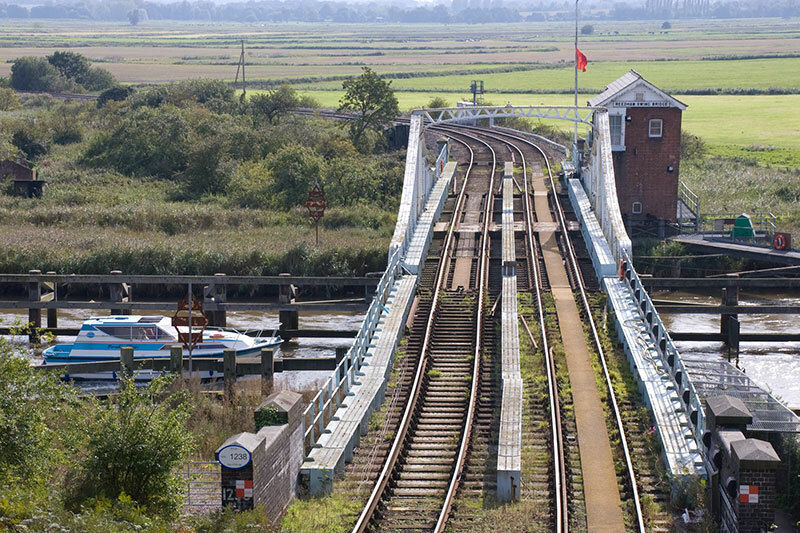 Samuel Morton Peto opened the first railway swing bridge at Reedham in 1847. He wanted to promote the development of Lowestoft as a major port and was a leading sponsor of the line. 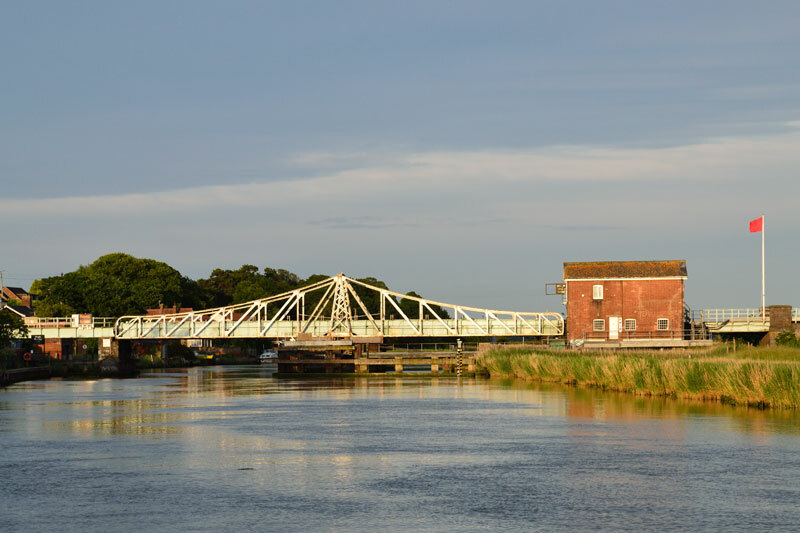 A new swing bridge at Reedham, built in 1905 replaced the single track bridge. This dual line catered for the extra holiday makers wishing to visit Lowestoft. The bridge you see today is the one built in 1905, it requires regular maintenance. On very hot days the metal can expand and the bridge may fail to open. Somerleyton is more prone to this due to it’s location. Network Rail spent thousands of pounds a few years ago to keep the bridges operational. They also funded the electronic signalling and the pontoons. The bridges are reaching the end of their working life. The cost to replace them runs into the 10’s of millions! 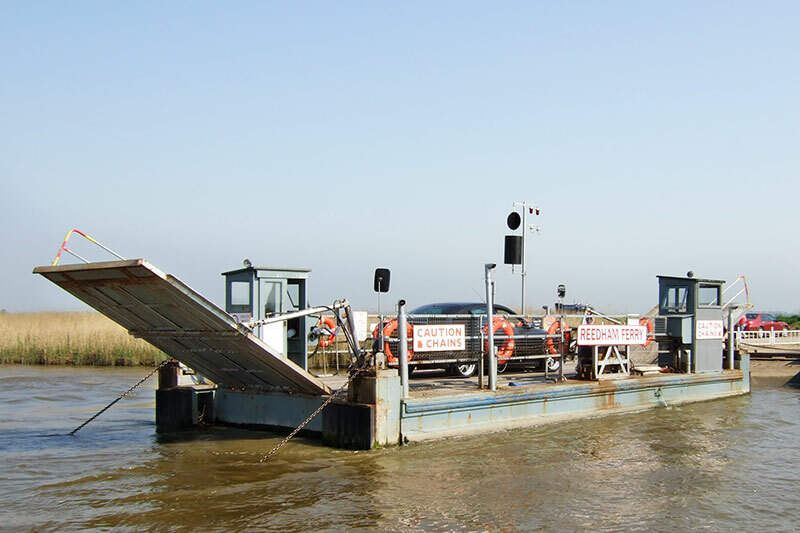 Reedham Swing Bridge has a headroom at average high water of 10 feet. This is enough for most cruisers except at very high tides. The bridge will open, subject to rail traffic, unless two red flags are flying. If the bridge is open look out for craft manouvering to pass through the bridge. You can get a great view of the swing bridge from above by taking a short walk. Head along the quay towards the bridge, follow the road around to the left and up the hill past the school. Turn right along Holly Farm Road to the road bridge above the railway. Daniel Hall built a large number of wherries in the Hall family’s boatyard here at Reedham. They include Hathor, Maud and Solace. 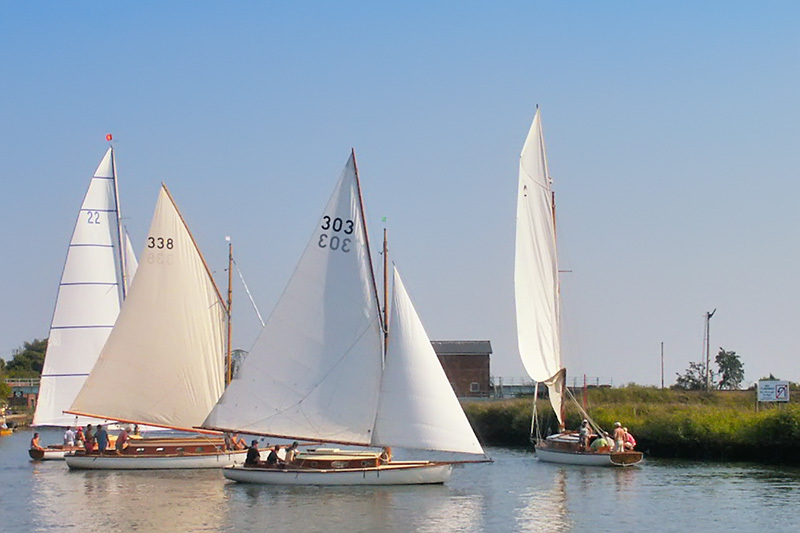 All three wherries regularly sail the Broads so you may see them on your travels. Near the site of the yard stands the sculpture of a boatwright. 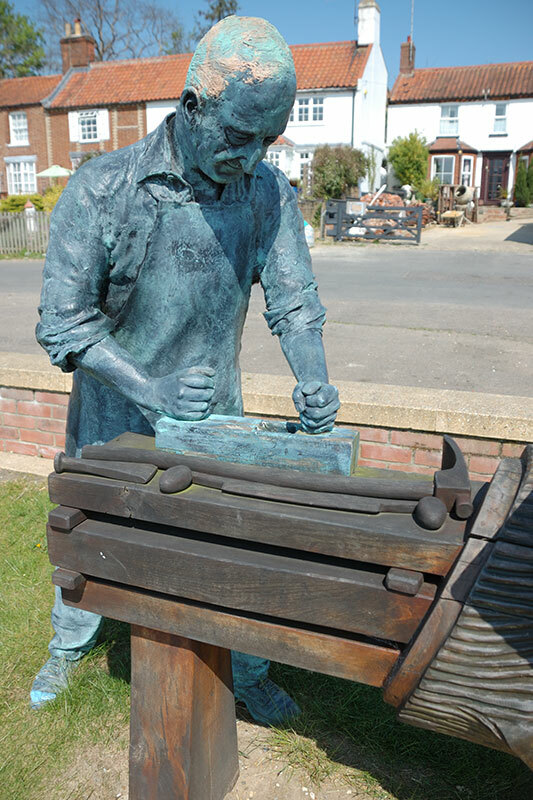 The figure is wearing an apron whilst working with his plane at a wooden work-bench. On the bench are the tools of his trade. Accompanying the figure is an information board describing the village’s boat building heyday. 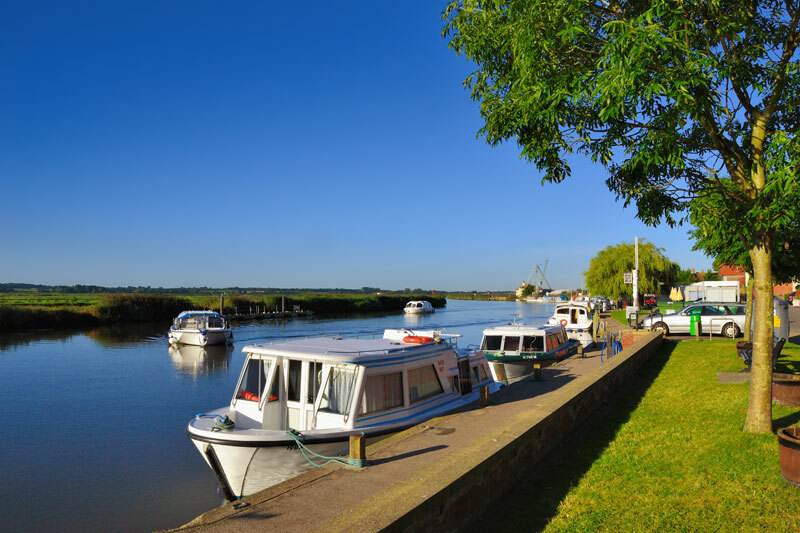 Reedham is well served by pubs, and you won’t have to walk very far to get to them. There is also a fish & chip shop, open Thursday to Saturday, lunchtimes and evenings. Situated in the middle of the public moorings is the Lord Nelson. 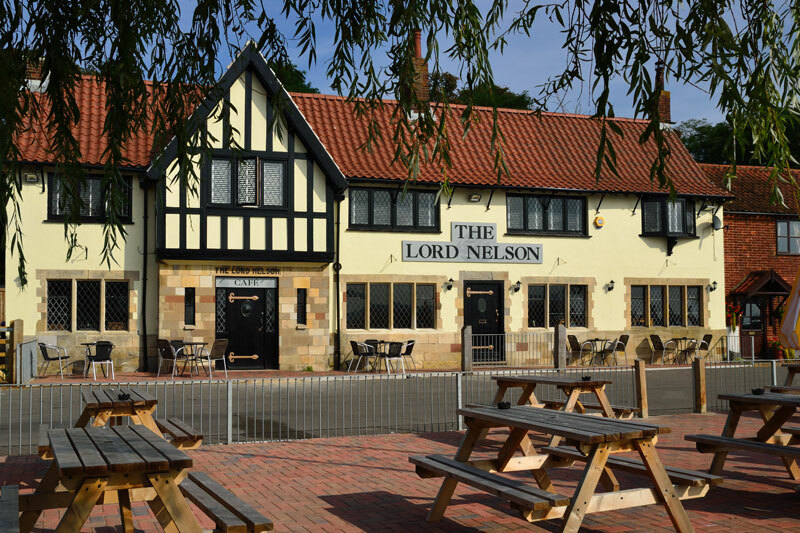 The Lord Nelson is a tradition pub with a modern feel. It’s known for it’s real ales includes those from the local Humpty Dumpty Brewery. There is a bar/lounge, a separate restaurant area and an outdoor seating area. Double alongside moorings are available for patrons. The Ship Inn is right next to the railway swing bridge. 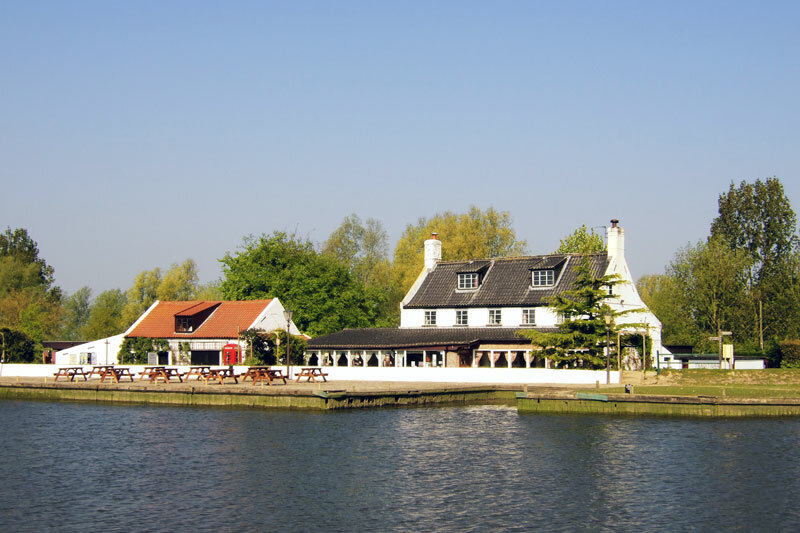 It has a large riverside beer garden with a children’s play area. It offers a range of classic pub grub including vegetarian options. Entertainment includes live bands, quiz nights and BT Sport. They have received ‘Cask Marque’ accreditation for their ales. Single alongside moorings are available for patrons. There is also a working men’s club in the village which welcomes visitors. A mile upstream from Reedham is The Ferry Inn. 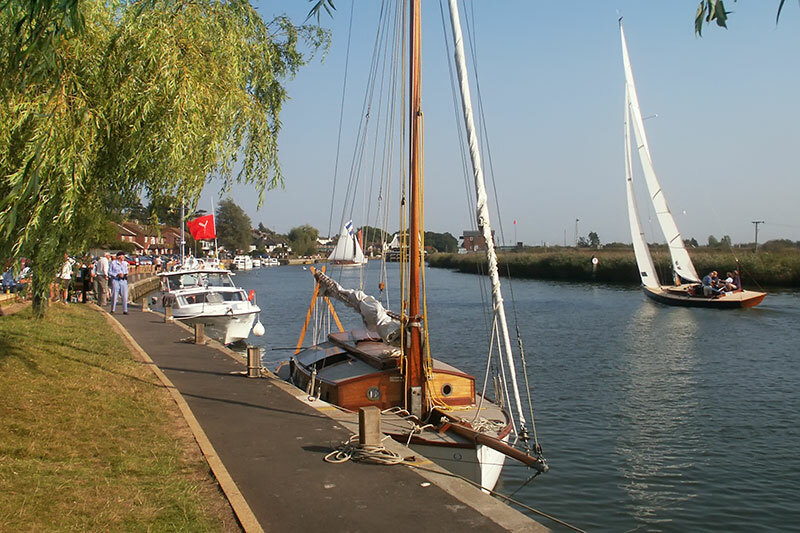 If you can’t find space at Reedham Quay there may be space here. It’s about a 25 minute walk by road but there is a footpath along the river. 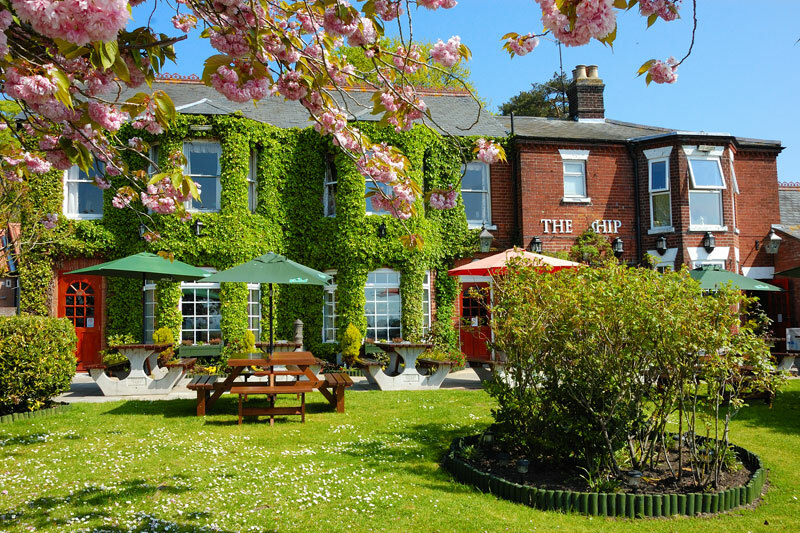 The Ferry Inn is a family run business known for it’s warm welcome and quality food. They offer local ales from Woodfordes of Woodbastwick and The Humpty Dumpty Brewery. I can recommend their à la carte menu, prepared using fresh locally sourced ingredients. Dogs are welcome in the bar and conservatory. There is also an outdoor seating area where you can watch the chain ferry in operation. For those colder nights the glow of the wood burner is always an attractive prospect. Moorings are available for patrons on both sides of the chain ferry but much of the upstream moorings are in a poor state of repair and are unsafe. You will also find a 4 acre camping and touring park set in an attractive wooded area with views over the marshes. Fishing is available both on the Yare and in the sites lakes. 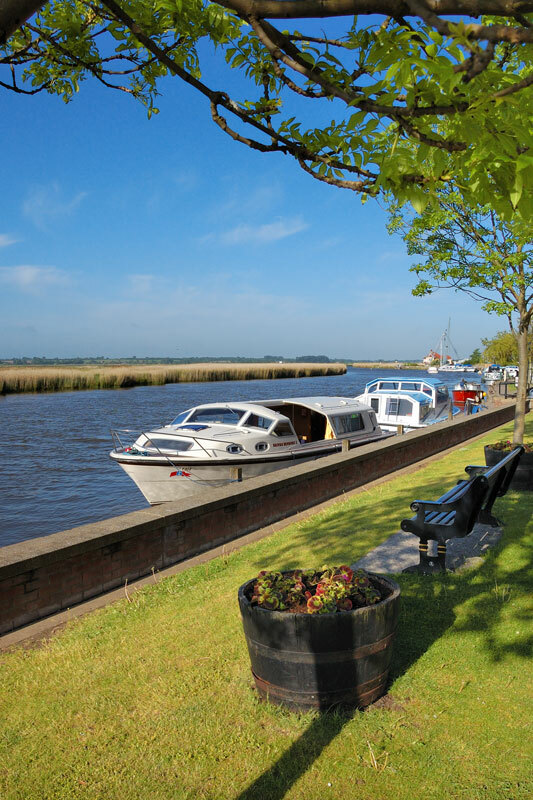 Reedham is one of the best vantage points to watch the Yare Navigation Race. The race, held each year in September is for River Cruiser Class yachts. It starts at Coldham Hall proceeds down the Yare to Breydon Water and then heads back. 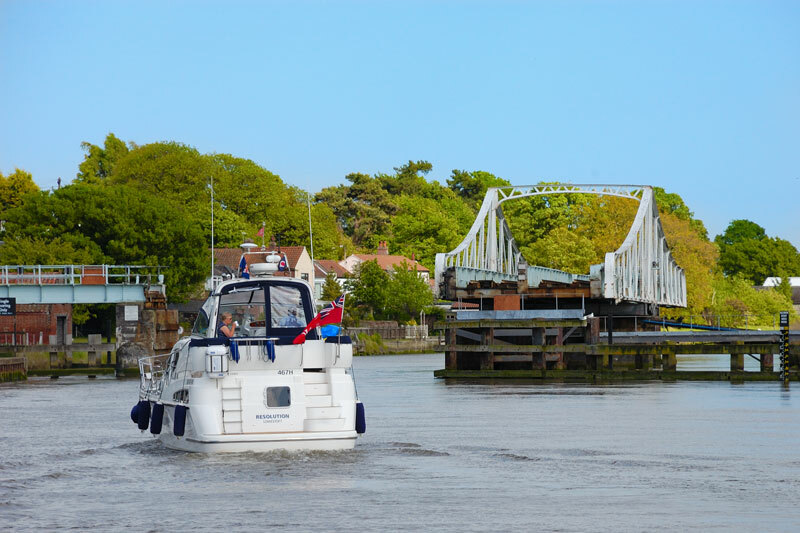 The reason that Reedham is one of the best places to watch the race is the swing bridge. When the bridge is closed it causes a bottleneck. There are usually between 50 and 60 yachts taking part. It’s quite common for there to be up to 20 yachts waiting for the bridge to open. It’s exciting to watch the skill of the skippers as they manoeuvre their yachts as they wait for the bridge to open. There has been a river crossing here since the 17th century. The Archers have owned and operated the ferry service since 1949. Built at Oulton Broad in 1984 the current chain ferry had a refit in 2016. It can carry a maximum of three cars. It is the only crossing of the Yare between Breydon Bridge and Postwick Viaduct. The ferry operates from Monday to Friday 6.30 am until 10 pm and Saturday and Sunday 8 am until 10 pm.